Today is the day. 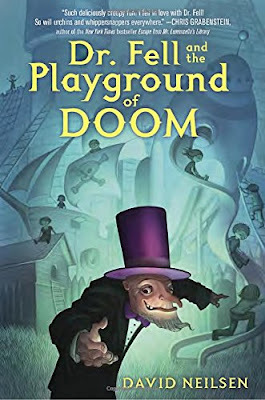 Today is when you should all be getting your hands on Dr. Fell and the Playground of Doom. Remember my rave review a week or so back? Yep, I'm back today, on the book's birthday, to share an interview with the author. E: Hi David! Thanks so much for doing this interview. I admit, I'm quite a fan of this book. How did you get the idea for the story? When did you first run into the name "Dr. Fell"? D: The idea for the book came from an illustration by the late children's illustrator Trina Schart Hyman. It had been hanging on the wall of my in-laws' for years. It shows a man in a suit and top hat leering down at a little girl, who looks back at him suspiciously. The man has a large basket strapped to his back out of which are sticking various arms, legs, and heads of little children. It’s labelled "Dr. Fell" and Hyman drew it when asked to create an image from her favorite fable or fairy tale. Curious, I looked up Dr. Fell online and discovered the four-line poem written in 1680 which I’ve included at the beginning of my book. Right away all sorts of questions jumped into my head. Who is this guy? What is he doing? What happens when he comes to town? The story began to take form when I went about answering these questions. That does sound intriguing; I wish I could see the illustration. But still, how does a trained actor/storyteller—who prefers the likes of H. P. Lovecraft and sends "many screaming into the hills in search of their sanity"—decide to write a book for children?? I have always believed that children deserve to be sent screaming into the hills in search of their sanity as much as adults. All kidding aside, since the original drawing features Dr. Fell and a young girl, I always felt this was a story centered on children. Dr. Fell is a story of innocence and imagination and facing the unknown. The Middle Grade reader is the perfect age to explore these themes. Much older, and kids become too cool for wonder and magic. No one is too cool for a Playground of Doom! What would be your ideal playground? What sorts of things would be included? Great question. My ideal playground has lots of things to climb and different ways to climb them. I actually had the opportunity to design my dream playground a few years ago when I led a team that designed and built a new playground for our local elementary school. We've got a climbing wall, nets, spinners, and best of all a massive, 16-foot-tall sphere intersected by dozens of sturdy ropes called a spaceball. As much as I built it for the kids, I had to be one of the first people to climb to the top of the spaceball. When did you first discover your love for horror stories and all things creepy? I admit, I'm more of a Poe fan myself, but what drew you to Mr. Lovecraft in particular? It took me some time to come to appreciate the horror genre, I didn't read horror or see scary movies as a kid. But I have always enjoyed learning about the worlds behind the stories. I didn’t want to read about or see the terrible things happening to people, but I wanted to know where the monsters came from. That led to a love of science fiction, which is really a next-door neighbor to horror. As I grew more fascinated with darker science fiction, I found my way into Lovecraft’s blend of science fiction and horror which is often referred to as Weird Fiction. I read a couple of his short stories (The Statement of Randolph Carter, The Rats in the Walls) and became a fan, but when I read The Call of Cthulhu, it sealed the deal. What led you to be a professional storyteller and actor? Growing up, all I ever wanted to do was be an actor. I went through high school with theater as the center of my life, then went to U.C. Santa Barbara and earned a degree in theater. I moved to LA to pursue a career in movies, but so did thousands of other people so things didn't quite fall into place. Years later, after moving with my family to New York and landing in the Hudson Valley, a creepy and beautiful place, I started telling spooky stories at the library and at Sleepy Hollow Cemetery. From there I transitioned into storytelling professionally. It was a natural fit, combining my love of performing with my writing and improvisational instincts. It took twenty years, but that degree in theater finally proved useful. I absolutely loved reading the audiobook. We recorded in Manhattan in the offices of Listening Library—the audiobook division of Penguin/Random House. It was just me and the director in this tiny studio, and I spent two full days in a small, foam-walled booth a little bit wider than the chair I sat in. The book was actually on an iPad, so I silently scrolled with my finger as I read. There was a large microphone hanging in front of me, and a tiny side table with a pitcher of water and a green apple. I read the book straight through over the two days, with my director occasionally asking me to repeat a phrase, or to take a bite of apple to reduce the clickiness in my voice (a trick of the trade). I had already devised a number of voices for the characters, and he helped me keep them all clear and distinct as we went along. I often ask authors for their advice for other writers, but in your case, I wanted to ask about the horror genre in particular—what is your advice for people (kids or adults) who want to write scary stories? Begin by writing short stories. One of the great things I learned about writing horror is that there are many outlets for scary short stories. Sites like Horror Tree and Dark Markets list countless calls for horror submissions every day. The sites are also great places for inspiration, as most magazines or anthologies are looking for specific themes, and reading about them can often inspire a story you didn’t know you had within you. The markets range from amateur groups that don't pay anything to very professional groups that can pay quite a bit. I sold quite a few short stories over a couple of years before I felt confident enough to try my hand at a longer work. I’m a big baseball fan. As a kid growing up in Santa Cruz, California (in the days before the internet), I would spend hours lying on the floor, holding the AM radio up just right to catch the faint signal coming from KNBR in San Francisco to hear the Giants' games. These days I follow them online or on TV. I love going to live games, not just MLB, but independent, minor league, even college or high school games as well. I’ve also been coaching my son's little league for the past six years, which has been a dream come true—literally. Baseball and horror stories—how about some lightning-round style questions to find out more? Aquaman? Well, to each their own. Thanks, again, David! And thanks for writing such an awesome book! 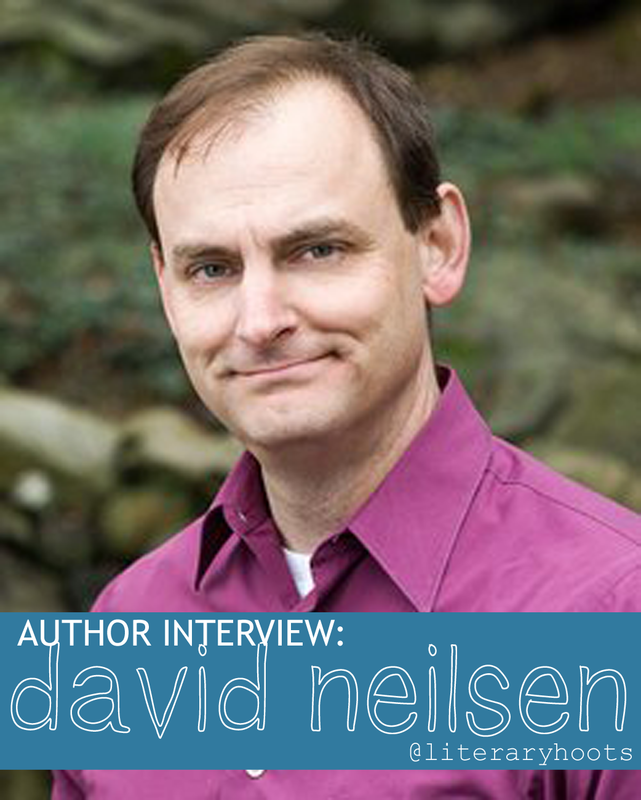 Remember, you can find out more about David Neisen on his website or follow him on Twitter. 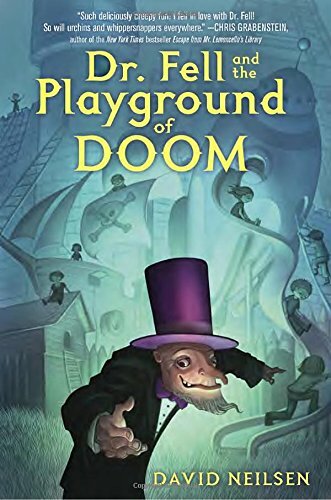 His first book for middle-graders, Dr. Fell and the Playground of Doom is out TODAY, so find it at your library or on Amazon!